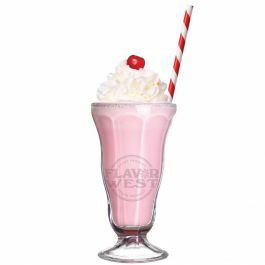 Strawberry milk shake flavor offers a smooth and milky strawberry taste. This flavor standalone on its own and can be a great start to other recipes. Type: Strawberry milk shake Water Soluble Flavoring. Ingredients: Natural and Artificial Flavoring, Propylene Glycol and Ethanol. USP Kosher Grade Flavoring. Flavor Suitability: Good for beverages, baking treats, candy flavoring and more. Specific Gravity: 1.04 No Refunds on Flavoring.